You don't have to give up the chocolate bunnies and jelly beans on Easter morning — just be sure to not spoil your Easter Brunch at Jag's! Jag's Steak and Seafood is taking reservations Easter Sunday, April 21 from 10 a.m. - 3 p.m., and we'll have something for everyone in the family! Our Easter Brunch features both adult and children's prix-fixe menus with numerous shareables, seasonal favorites, and Easter-themed activities to help you and your children get in the spirit of spring. Plus, for guests over 21, our brunch cocktails will be the perfect way to top off your morning Easter egg chase. Everyone can start with an Easter appetizer or two. Your crowd-pleasing options include Camelot Chicken, Spinach & Artichoke Dip, Cheese & Charcuterie, Ricotta & Pea Bruschetta, Salt & Pepper Calamari, and Fire & Ice Shrimp Cocktail. The regular prix-fixe menu includes three tiers of options priced at $40, $50, & $60, each including a first course, entrée, two sides and a dessert. 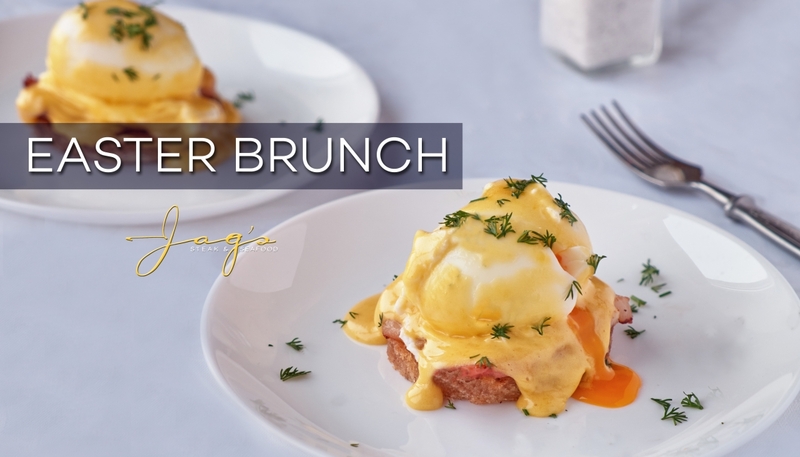 Each tier includes your choice of traditional Jag's favorites — like Boursin Berry Salad, Chilean Seabass, or The Big Oscar — plus special menu items you'll find only at our Easter Brunch — like Chicken & Waffles, Herb Crusted Prime Rib, or Crab & Lobster Benedict. We can also assure you we'll have something your children will love. For just $15, they'll have a first course of various fresh fruit and vegetable selections, a kid-friendly entrée course, and a menu of sides including Fried Potato Wedges, Garlic Mashed Potatoes, Green Beans, or Broccoli. To finish, we're helping the kids show their creative sides. Included in their meal will be the option to visit our sundae bar, where they dress their ice cream sundae just how they like it. There will also be a craft area set up in the Cellar for kids to participate in more Easter-themed fun. The kids craft area and sundae bar will be open for all children 15 and younger. A special Sunday awaits at Jag's! Take advantage by making your family's reservation here.